When you’re looking for a way to enjoy the view of your backyard without having to deal with the common weather elements experienced in Rochester, New York, and the surrounding areas, it is likely that you are leaning towards either a sunroom or screen room. However, at Pro Home and Sunrooms we offer a product that takes the best of both products and combines them into an impressive product known as the Ultimate Screen Room. This unique extended season room has been upgraded to include glass and will grant you the ability to have a screen room when you want it or a sunroom when you’d prefer that. Studio – The perfect choice for either one- and two-story homes due to its gentle roof pitch and one, two, or three-wall configurations. Low Cathedral – A low cathedral style structure will be perfectly suited to a single story home and features an attractive vaulted ceiling. Furthermore, when you choose to work with Pro Home and Sunrooms for the installation of an Ultimate Screen Room, you will be able to rest assured that you are receiving a high-quality, American-made product. We stand by the products we offer and the factory-trained experts who install them so much that we offer an incredible lifetime warranty to allow you to feel confident in your investment. 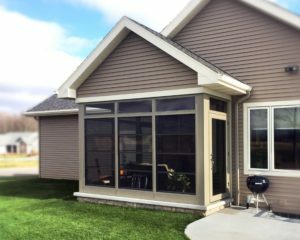 For more information about how the Ultimate Screen Room is the perfect choice for your home in Rochester, NY, or a surrounding area, contact Pro Home and Sunrooms today. Make sure to ask about the financing options available to all qualifying homeowners.